A fresh coat of paint can transform the look of your bathroom! The walls in your bathroom are susceptible to water, toothpaste, soap scum, hair products, and other substances. Before you paint, be sure to clean the walls to ensure that you’ll get an even and smooth application with your brush or roller. Any of the before mentioned substances will cause your paint to peel and chip prematurely. Save yourself some of the stress and energy it would take to try to paint around your toilet tank. It’s a task that would require a considerable amount of coordination, and still not guarantee the flawless application of your paint. Remove the toilet tank before you get started. It is a simple process that doesn’t involve any mess. All you need to do is turn off the supply at the base of the toilet, flush to get rid of the remaining water and use a few old towels to set the tank on the floor while you paint. Since bathrooms are usually smaller spaces than other rooms in a house, keep the colors light and easy. Dark colors in an enclosed space could make the room look and feel even smaller. Try lighter hues and varieties of your color choices. Example include light blue, light yellow, and neutral, cool, or muted tones. Remember that bathrooms see a lot of water and moisture. With that in mind, choose a paint that will be able to withstand that amount of wetness. 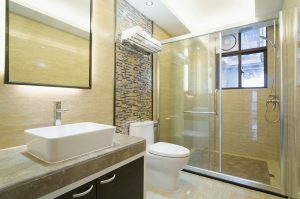 While buying a bathroom-specific paint isn’t necessary, you do need a paint is resistant to moisture, and that features mold-inhibiting properties. Painting the shower isn’t always the best suggestion, but if you must, go with a glossy finish. If your shower happens to have painted drywall rather than tile, glossy paint is the best choice.